FREE Candy At Rite Aid!!! Hurry, Hurry! I am so excited about this candy deal . . . literally the sweetest deal!!! I got all these bags for FREE!!! You can get your FREE CANDY by buying the bags that are on sale through Saturday for 2 for $5. Make sure to buy in groups of 2 . . . then you will receive $1 +Up Rewards and also two $2 +Up Rewards back for every 2 bags you buy . . . which makes it FREE! If you wanna do this deal, run to Rite Aid now . . . word is spreading & candy is flying off the shelves! If you need (or want!) 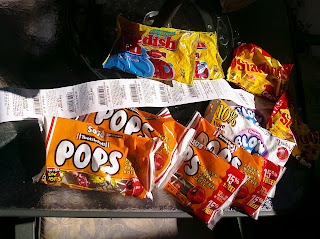 a bunch of candy, be sure to use the $5 off $25 Rite Aid coupon! Then buy 12 bags (for a total of $30). Use the $5 off $25 coupon, and you will actually end up MAKING MONEY!!! Sweepstakes: The Melting Pot's Big Night Out France Sweepstakes! The Melting Pot has a new Sweepstakes in honor of their French inspired new fall menu! Head on over here to sign up to win a trip for 2 to Bordeaux, France! How romantical! ;-) There are a bunch of other prizes, too . . . like fondue for a year and various gift cards! They'll let you know on November 23 if you're a winner! CVS: $5 worth of Halloween goodies for FREE--did you get it too?!?! The big red coupon machine (you know, the thing that looks like an ATM in the store!) at CVS popped out a nice surprise for me today . . . a $5 off any Halloween accessories or decor, etc.!!!! That means I got $5 worth of Halloween goodies for FREE!!! I decided to get this Pumpkin Decorating Set. It has a bunch of eyes, noses, mouths and more to customize your pumpkin! It was priced at $ 4.99 . . . so FREE! Did you get this awesome coupon from the big red machine?!?!? Make sure to scan your card at the machine every time you're in CVS . . . you never know what you may get! 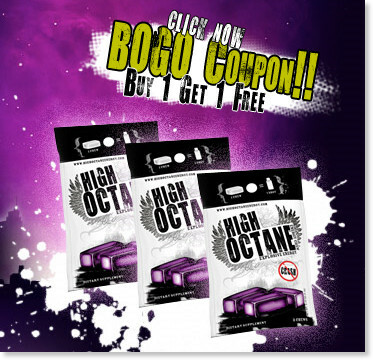 Coupon: BOGO High Octance Energy Chews! If you head on over here you can print out a coupon for Buy One Get One Free High Octane Energy Chews! I know you can find these at CVS and Rite Aid and it looks like a bunch of universities and colleges as well! 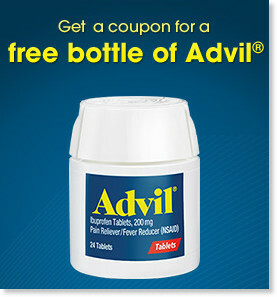 Freebie: FREE bottle of Advil! Sign up to get a free bottle of Advil! Hurry though . . . only 500,000 bottles to go around!